Coronal mass ejections (CMEs) and solar flares are two examples of major explosions from the surface of the Sun — but they’re not the same thing, and they don’t have to happen at the same time. A recent study examines whether we can predict which solar flares will be closely followed by larger-scale CMEs. A solar flare is a localized burst of energy and X-rays, whereas a CME is an enormous cloud of magnetic flux and plasma released from the Sun. We know that some magnetic activity on the surface of the Sun triggers both a flare and a CME, whereas other activity only triggers a confined flare with no CME. But what makes the difference? Understanding this can help us learn about the underlying physical drivers of flares and CMEs. It also might help us to better predict when a CME — which can pose a risk to astronauts, disrupt radio transmissions, and cause damage to satellites — might occur. In a recent study, Monica Bobra and Stathis Ilonidis (Stanford University) attempt to improve our ability to make these predictions by using a machine-learning algorithm. Bobra and Ilonidis used magnetic-field data from an instrument on the Solar Dynamics Observatory to build a catalog of solar flares, 56 of which were accompanied by a CME and 364 of which were not. The catalog includes information about 18 different features associated with the photospheric magnetic field of each flaring active region (for example, the mean gradient of the horizontal magnetic field). The authors apply a machine-learning algorithm known as a binary classifier to this catalog. This algorithm tries to predict, given a set of features, whether an active region that produces a flare will also produce a CME. Bobra and Ilonidis then use a feature-selection algorithm to try to understand which features distinguish between flaring regions that don’t produce a CME and those that do. Under the right conditions, their algorithm is able to predict whether an active region with a given set of features will produce a CME as well as a flare with a fairly high rate of success. 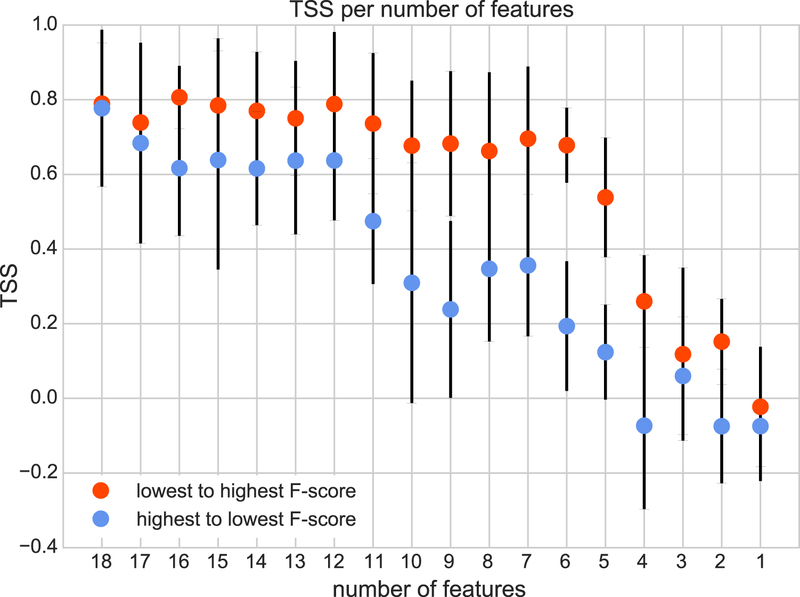 None of the 18 features they tested are good predictors in isolation: it’s necessary to look at a combination of at least 6 features to have success predicting whether a flare will be accompanied by a CME. The features that are the best predictors are all intensive features — ones that stay the same independent of the active region’s size. Extensive features — ones that change as the active region grows or shrinks — are less successful predictors. Only the magnetic field properties of the photosphere were considered, so a logical next step is to extend this study to consider properties of the solar corona above active regions as well. In the meantime, these are interesting first results that may well help us better predict these major solar eruptions. Check out this video for a great description from NASA of the difference between solar flares and CMEs (as well as some awesome observations of both).